This image is only available as an 8x10 print and is not available as a digital file.. Flyer containing paint chips for repainting International Harvester tractors and farm machines. 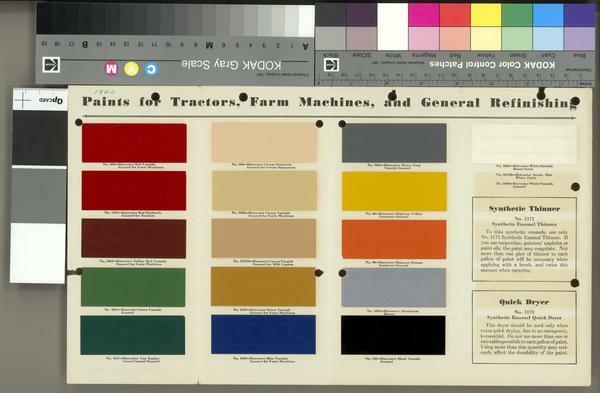 The chart includes "Harvester Red Varnish Enamel for Farm Machines, Harvester Red Synthetic Enamel for Tractors, Harvester Indian Red Varnish Enamel for Farm Machines, Harvester Green Varnish Enamel, Harvester Gas Engine Green Varnish Enamel, Harvester Cream Synthetic Enamel for Cream Separators, Harvester Cream Varnish Enamel for Farm Machines, Harvester Cream Varnish Enamel for Milk Coolers, Harvester Ochre Varnish Enamel for Farm Machines, Harvester Blue Varnish Enamel for Farm Machines, Harvester Motor Gray Varnish Enamel, Harvester Highway Yellow Synthetic Enamel, Harvester Highway Orange Synthetic Enamel, Harvester Aluminum Bronze, Harvester Black Varnish Enamel" and "Harvester White" interior and exterior house paint. Use this chart with caution! The colors you see on your computer screen or printout may vary dramatically from the original depending on your equipment. We have included a standardized Kodak Gray Scale and Color Control Patches to help verify the accuracy of the colors. We have also taken great care to produce accurate, color calibrated prints of this paint chart. Differences in materials and printing techniques prevent us from producing a reproduction that is 100% accurate. However, the prints represent the best result we have been able to achieve with modern equipment and Epson Ultrachrome© pigmented inks. To order one of these prints, please note the "Image ID" number near the top of this screen and follow the "How to Order" link. This image is only available as an 8x10 print and is not available as a digital file.